Today is all about positivity! Staying positive is something which I find rather difficult sometimes. This isn't a frequent aspect in my life but I do have them days just like everyone else when I'm feeling down and I find it difficult to stay positive, no matter what I do. 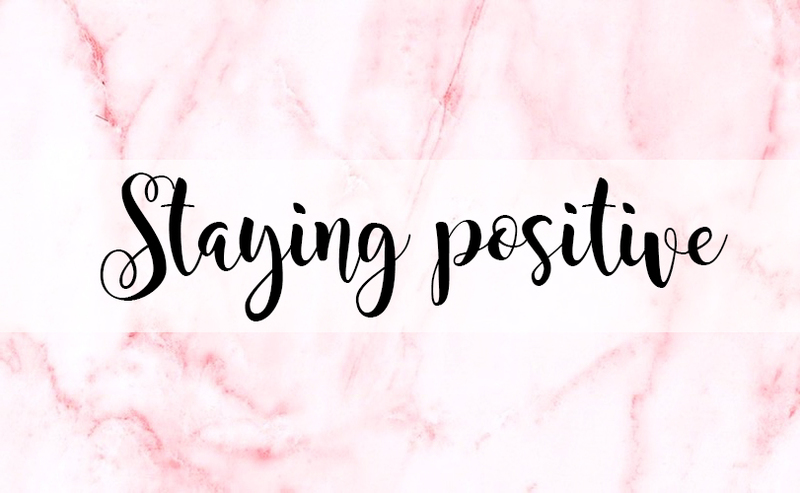 Unfortunately, staying positive when you have so much uni work to do, blog posts to write up and people to catch up with while also drowning in everything else in your life is definitely challenging and sometimes we cannot cope. Sometimes I find it difficult to also stay positive in myself. There are days when I feel really happy and confident in myself but then there are the days when I'm feeling rubbish and I just want to chop of every single limb of my body and start again. With society as the way it is, social media definitely doesn't help with situations like this. However, since being in school and now growing up I have come to learnt that absolutely everyone is different and the things I might not like about myself, someone else might love about me and I needed to learn to love the parts of me I really do not like. Stress is something which appears in everyone's life at one point or another and one way of dealing with it is to run from it. I have found the best way of dealing with stress is to face it. Find the cause of the stress and either find a way around it to make it better, or to get rid of it completely. I'm usually one for just getting read of it as if it's stressing you out, it's not worth having in your life. I have also found one way of staying positive is to realise not everything happens all at once and sometimes taking small steps is the only way to get to the place we want to be. For example, I want to be a primary school teacher however each day I have to take more steps to get to where I want to be and it's not going to take a couple of months. In fact it's going to take four years to get there but I know I will, eventually. It's finding the light at the end of the tunnel. Do not look back and wonder why things went wrong. Do not regret not doing more. It happened for a reason and there are better things to come. Lovely post. It's definitely better to face stress rather than run away from it so that you can decide whether it needs to be in your life! Great post lovely! I really struggle to stay positive at times so I can definitley relate. It's hard to stay positive and happy all of the time when stresses of everyday life get in the way, but I like your approach of trying to get rid of the problem as best you can.